With a yogurt based shell, this tart is lower in calories! 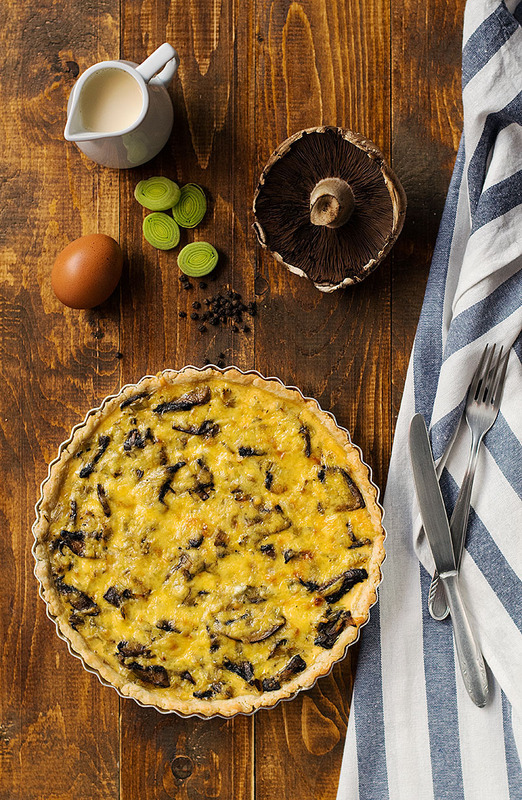 In my mind, a tart is linked with holiday meals, parties and celebration or formal dinners. Don’t ask me why, I don’t have a solid answer to give you… Maybe it’s because it has a festive character which at the same time conveys elegance… Maybe it’s because from the minute a hot piece is presented in front of you, its warm and delicate aroma just swipes you off your feet like a mellow lullaby… Or maybe it’s because it is rich not only in taste but also in calories, meaning it’s not something to enjoy every day, especially if you’re watching your weight! 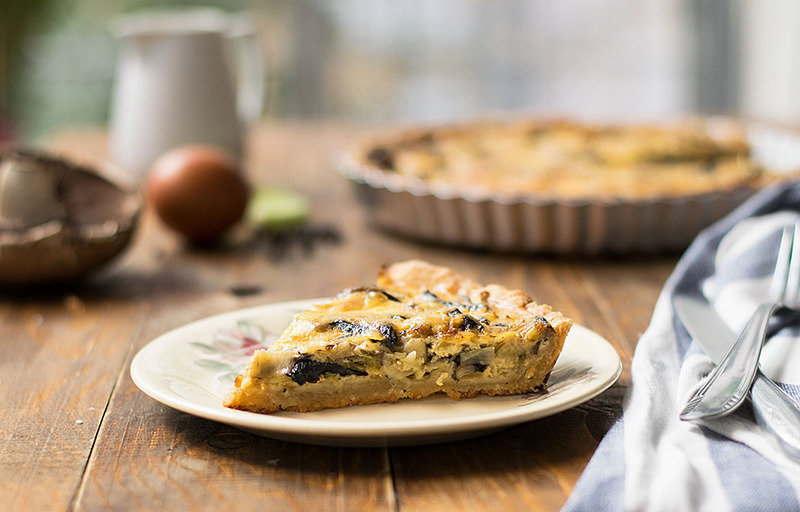 This tart is not only silky smooth and scrumptious, but also has fewer calories than your average tart recipe since part of the butter is replaced with some thick, protein rich, Greek yogurt! Oh, and did I tell you that you don’t have to roll out the dough for the crust? 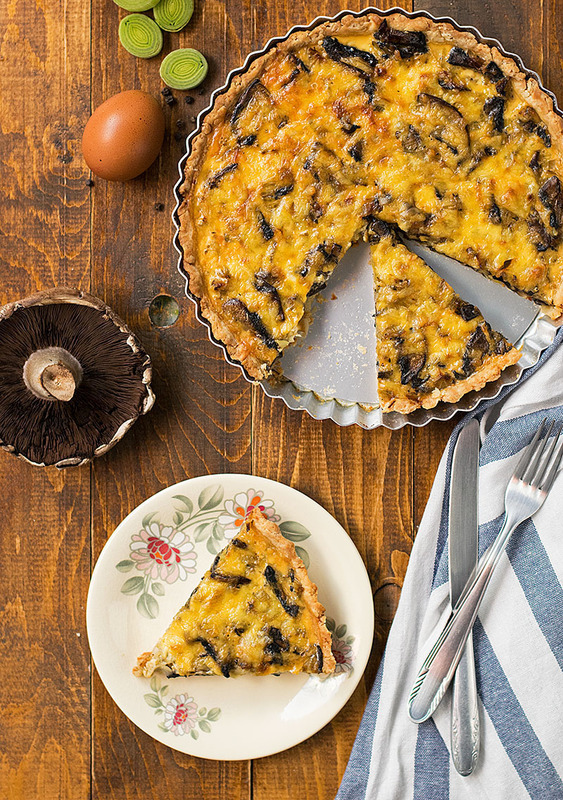 Though this is a meatless tart, you’ll be amazed by its richness! Portobello mushrooms have a lot to do with this, since they give a nice meaty flavor and a good bite. Leeks offer an incomparable sweet earthiness which pairs really well with the taste of the parmesan and cheddar cheese making every bite an experience you don’t want to end! This party of flavors and textures is completed by the fragile, creamy, savory custard consisted of just milk and eggs. Did you notice that I didn’t mention any cream? Yes, another thing that makes this recipe lighter with fewer calories is the fact that cream is replaced with skimmed milk. But trust, me you won’t even notice the difference! For this recipe you don’t have to roll out the dough. You just pinch off pieces and lay them on the tart pan (bottom and sides) until you cover it. Then, with the back of a spoon, you just level the surface and make sure there are no holes. That easy! For a perfect result, it’s best to blind bake the tart shell before you fill it with the filling. And because the filling has a lot of moisture it’s also best to reserve an egg white, beat it slightly and brush the shell just before filling it. This will kinda seal the crust and protect it from absorbing too much moisture. I know prebaking the shell sounds like extra work, and I admit I don’t always do it myself either, because this tart comes out delicious either way, but it’s a good thing to know for when you have some extra time in your hands or for the times you want to go over the top. I find that all tarts bake better in the lowest shelf of the oven, since the crust can brown better and get nice and crispy. As I’ve also mentioned in my yellow split pea puree with mushrooms and caramelized onions post, when cooking the mushrooms you should brown them very well. Just wait until all of their water has evaporated and keep stirring them in the pan until they caramelize and develop a nice color. This is the trick which gives them really good depth of flavor! This tart pairs very well with this orange, lettuce and mango salad. If you’re in the mood for even more cheese though, you should try this arugula, goat cheese and green apple salad! 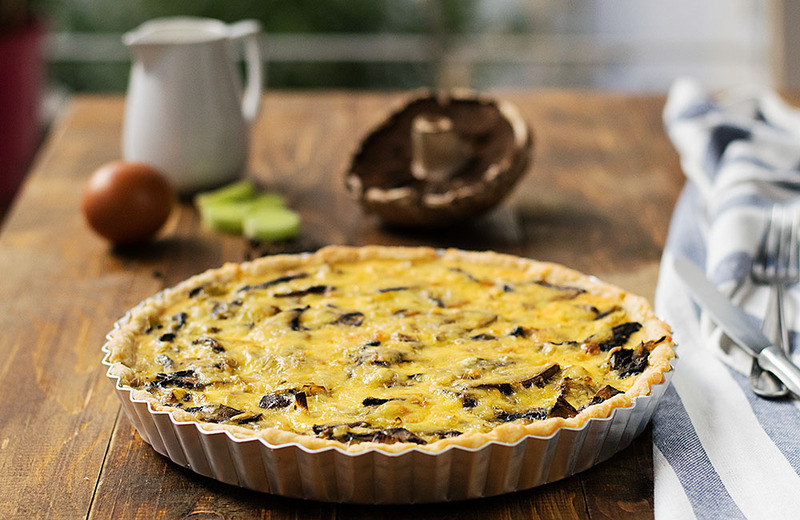 With a yogurt based shell and skimmed milk instead of cream, this tart is lower in calories! Plus, you don’t have to roll out the dough! Make the shell: in a large bowl combine all the ingredients and mix with a fork until coarse crumbs are formed. Transfer to a work area and knead with your hands until it comes together. Make the filling: In a saucepan over high heat, cook the mushrooms and thyme with 2 tablespoons oil. At some point they’ll start to water out. Cook until all of their water has evaporated and then cook some more, about 5 minutes, until very fragrant and browned. Transfer in a large bowl to cool. In the same saucepan with the remaining oil but in medium-low heat, cook the leeks until tender and soft, about 10-15 minutes. Transfer into the bowl with the mushrooms, add some salt and pepper, mix and let them cool for 5 minutes or more. Take the dough, pinch off little pieces and gradually cover the tart pans with them. Level the surface with the back of a spoon (you can also roll out the dough if you like). At this point you can either pre-bake the shells as are (no need in filling them with beans or other staff, they’ll hold their shape) or you can choose not to. If you choose to bake them, do it until they are golden brown, about 20 to 30 minutes. Then let them cool a little. Whether you pre-baked the shells or not, slightly beat the egg white until foamy and brush the shells to make a seal. Combine the cheese with the leeks and mushrooms and divide into the pans. Beat the milk with the eggs and a pinch of salt, and then divide it into the pans. Bake the tarts on the lowest rack of your oven for 35-45 minutes or until filling is set and the crust golden brown. The recipe is for 2 tarts. 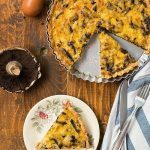 You can divide it for just one tart, or better yet, divide just the ingredients for the filling and store in the freezer half of the dough for later use!